Do you have your food game plan ready for the super bowl? 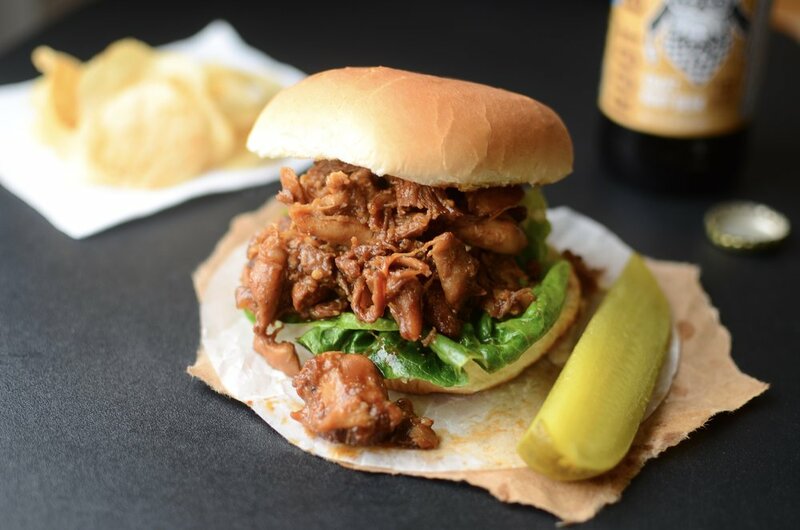 One of the things I’ll be serving are these BBQ Shredded Chicken Sandwiches. It’s such a quick recipe using an Instant Pot (electric pressure cooker or multi pot). Just stir the bbq sauce together and pour it over boneless, skinless chicken thighs and sliced onions. The whole thing cooks for just 15 minutes, then shred the chicken and serve. Easy-peasy! Start with some bbq sauce, I used homemade, and add a few flavorful additions. Place boneless, skinless chicken thighs in a 6-quart or larger Instant Pot, multi-pot, or electric pressure cooker. Pour the bbq sauce mixture over the chicken. Stir everything together well and place the lid on the cooker, being sure the vent is sealed closed. Set the cooker on high pressure for 15 minutes. When the time is up, quick release the pressure and remove the chicken. Set the cooker on “saute” or “sear” and reduce the remaining liquid by half (or transfer liquid to a saucepan and reduce it on the stovetop). 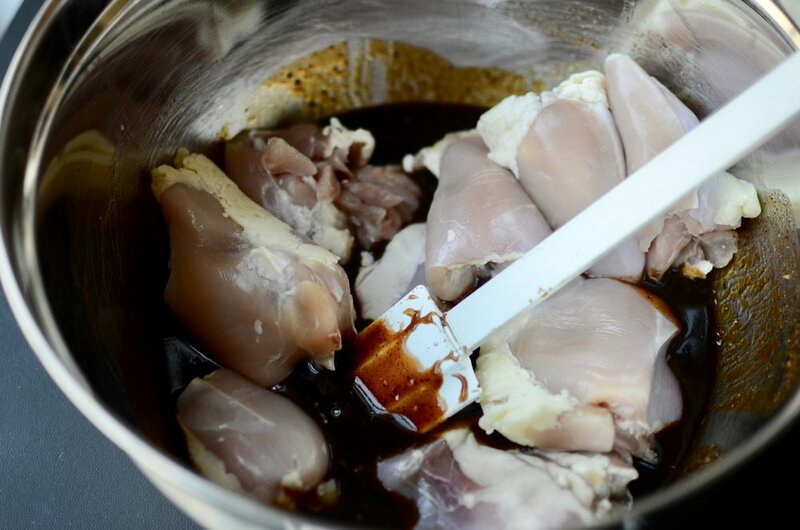 Shred the chicken with two forks or shredding claws and stir back into the reduced bbq sauce. Serve on rolls. Place chicken thighs and sliced onions in a large bowl. In a medium mixing bowl, combine the remaining ingredients; pour over chicken and onions and stir well to combine. Transfer mixture to a 6-quart or larger Instant Pot (aka multi-pot or electric pressure cooker). Cook on high pressure for 15 minutes; allow pressure to release naturally. Remove chicken from pot; set aside. Using saute function on Instant Pot (or in a saucepan over medium-high heat), reduce the remaining liquid by half, stirring frequently, until a nice bbq sauce forms. Shred the cooked chicken with two forks and add back to the bbq sauce; stir well and reheat gently if needed before serving. The inspiration for this delicious recipe came from a magazine. I made a few tweaks to the original recipe - it called for the use of bread crumbs, but I wanted to make it more Keto-friendly so I subbed almond flour and I’m so impressed with how wonderful that substitution worked out. It’s hard to believe something this tasty contains only 1 net carb per serving! Then coat them with almond flour. Be careful to not burn the almond meal. Set the chicken aside for now (it’s okay if it isn’t cooked through completely at this point). Clean out the pan and add a little more oil to saute the red bell peppers for 5-7 minutes. Add the sliced garlic and saute, stirring constantly, for 1 full minute. Add the chicken stock (try my homemade stock). Bring to a gentle bubble and cook until the mixture thickens and reduces by half. Reduce the heat to a simmer and stir in the butter. Return the chicken to the pan and stir well to coat well. Cover pan and continue simmering for 5 minutes until chicken is heated through. I like to serve this chicken on a bed of riced cauliflower. The chicken turns out so moist and flavorful - I really hope you’ll give it a try. Enjoy! Dip chicken pieces in beaten egg followed by almond flour; set aside while oil heats. 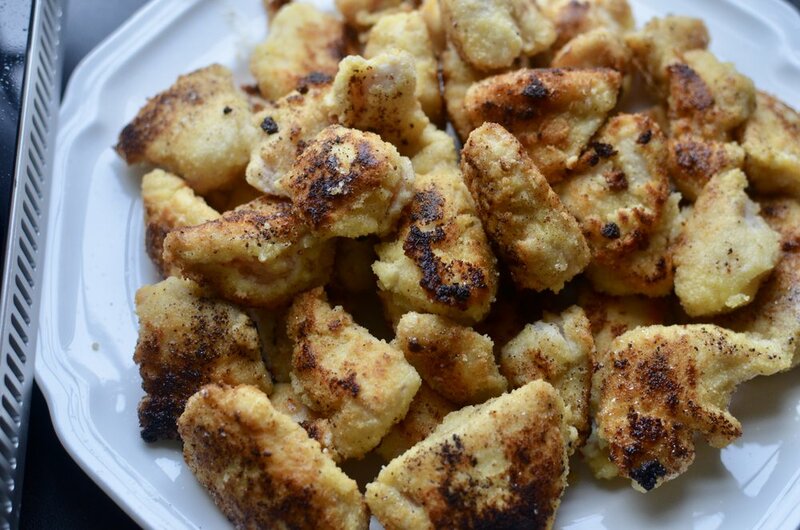 In a large skillet over medium heat, heat 1 tablespoon oil until it shimmers; brown half the chicken pieces until golden brown on both sides, being careful not to burn the almond flour; remove chicken from skillet and set aside. Wipe pan to remove any remaining almond flour; repeat step 2 with remaining chicken. 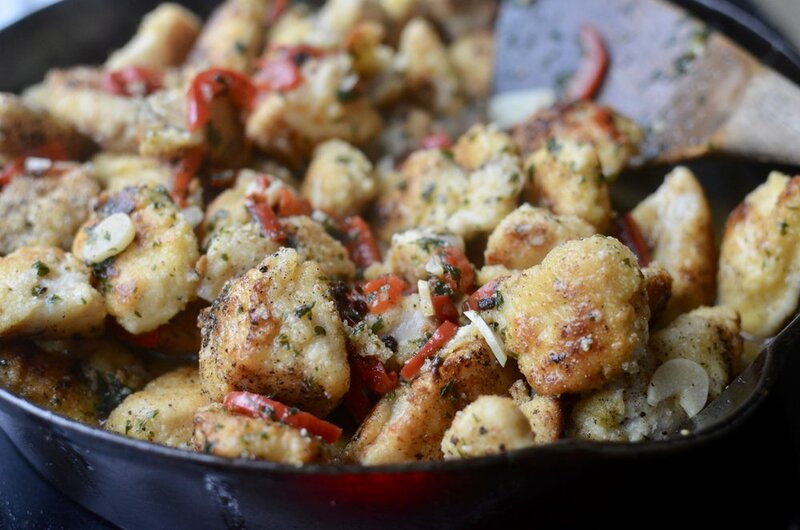 Wipe out pan to remove any remaining almond flour; add remaining tablespoons of oil in skillet and saute red bell peppers with a pinch of salt and pepper for 5-7 minutes, stirring frequently. Add sliced garlic and stir constantly for 1 full minute; add chicken stock and parsley and allow mixture to bubble until it thickens and reduces by half. Reduce heat to a simmer and stir in butter; taste and adjust salt and pepper if needed. Return chicken to pan and simmer for 5 minutes, covered, until the chicken is heated through; stir well and squeeze fresh lemon juice over chicken before serving (optional). Stats: each serving has 225 calories, 26g protein, 13g fat, 2g carbs, 1g fiber (1 net carb). 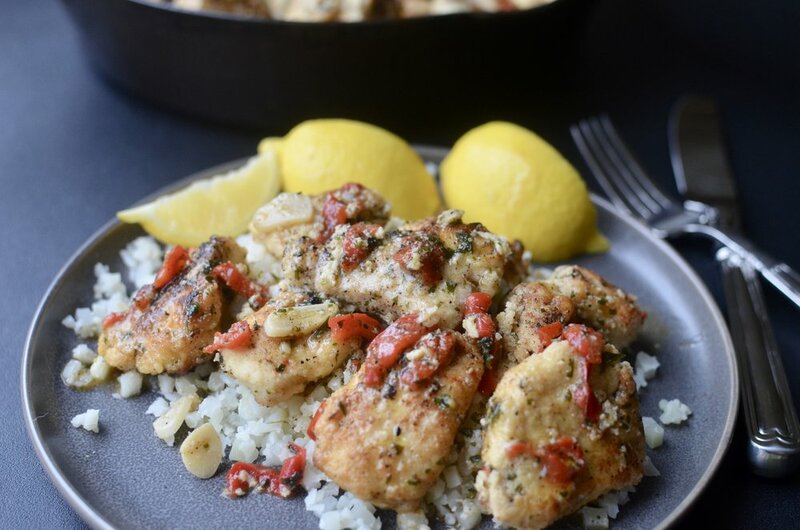 Today I’m sharing a simple chicken recipe that was inspired by a menu item I used to order at a restaurant years ago. The chicken is served slightly warm, which contrasts nicely against the cold, crisp lettuce, salsa, and cheese. This recipe is great any time of year, but it’s particularly nice served during the summer. Oh, and it’s Keto-Friendly too! Start with a bed of shredded lettuce on a plate. Add a grilled chicken breast that’s been seasoned with salt and pepper. Top with your favorite salsa or try one of my recipes. This Charred Poblano Salsa is one of my favorites. Want something green? Try this Charred Tomatillo Salsa (salsa verde). Here’s an Easy Restaurant Salsa featuring canned tomatoes and chiles. And here’s a post that teaches you How to Make Amazing Salsa Without a Recipe. Lastly, sprinkle the salsa with a liberal amount of finely shredded Mexican blend cheese. Season both sides of chicken breasts with kosher salt and black pepper. Cook chicken for several minutes on each side, until golden brown and cooked through; remove from heat and allow to cool for a few minutes. For each serving, place 1 cup of shredded lettuce on each plate, top with cooked chicken breast, 2 tablespoons of your favorite salsa, and 2 tablespoons of shredded Mexican cheese blend.